ASSOCHAM which has more than 400 Chambers and Associations serving over 4.5 lakh members across India has urged the government to help exporters receive their tax refunds without any further delay, adding that the govt must also ease rules for the GST administration on exports to sustain growth momentum. ASSOCHAM has listed several issues such as refund of GST paid on capital goods, export obligations, transfer of drawback scrips and early clearances of their dues on account of tax refunds for resolution by the GST Council and the Finance Ministry, says a release. �The growth in exports has picked up, providing momentum which must be maintained by making our goods competitive. We should fully tap the uptick in the global economy to our advantage. It is pertinent to ensure that our exporters remain fully funded and do not face any working capital shortage etc,� says ASSOCHAM. It said that as per section 16 of the IGST Act, the exporters have an option not to pay any IGST on the exports and claim refund of the GST paid on procurement of inputs and input services. However, no refund is available for GST paid on the capital goods per section 54(8)(a) of the CGST Act. 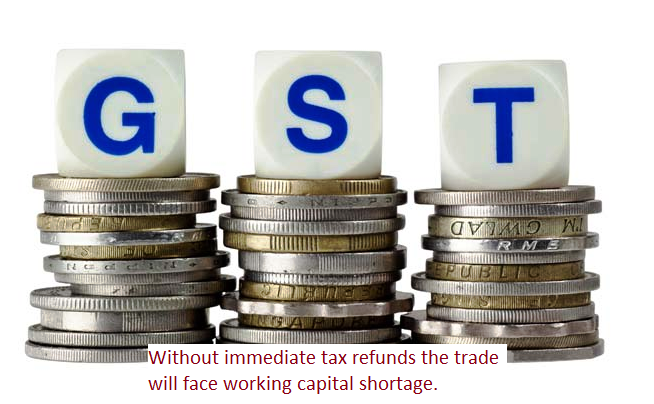 Since in case of exporters, there is no output GST liability, this result in blockage of credit of GST paid on capital goods, impacting the financial health of the exporters. It said significant amount of refunds pertaining to pre-GST period are yet to be granted to the assessees. The refunds are stuck either due to delay in processing of the refunds or in the litigations relating to eligibility/procedural aspects for refund claim. This has caused significant amount of funds blockage for the exporters.